Most measures of foreclosure activity in March remained at February levels but showed significant improvement from one year earlier according to the National Foreclosure Report for the month, released by CoreLogic today. The report tracks completed foreclosures, the foreclosure inventory, delinquencies and a measure CoreLogic calls the distressed clearing ratio. The number of foreclosures completed in March dropped to 66,000 from 69,000 in February and 85,000 one year earlier. During the first quarter of the year there were 198,000 completed foreclosures compared to 232,000 during the first quarter of 2011. The foreclosure inventory - homes in process of foreclosure - now constitutes 3.4 percent of all mortgaged homes in the U.S., a total of 1.4 million homes. This number is essentially unchanged from February but is down 100,000 homes compared to March 2011, a decline of 6 percent. The total number of distressed assets, including seriously delinquent loans (more than 90 days in arrears), homes in foreclosure, and lender-owned real estate (REO) now represented 7.0 percent of homes, unchanged from February but down from 7.5 percent in March 2011. "The overall delinquency level was unchanged in March, remaining at its lowest point since July 2009," said Mark Fleming, chief economist for CoreLogic. "Non-judicial foreclosure markets like Nevada, Arizona, and California are experiencing significant improvements in their shares of delinquent borrowers. 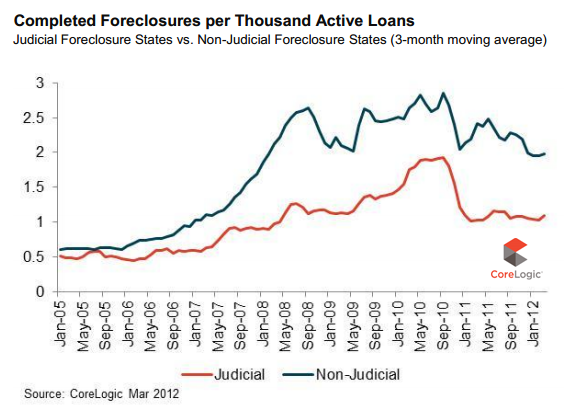 Some judicial foreclosure states are also improving, like Florida, but not to the extent of non-judicial markets." The distressed clearing ratio which is calculated by dividing the number of REO sales by the number of completed foreclosures rose from 0.76 to 0.81 in March. A higher pace indicates a more rapidly clearing inventory. Compared to a year ago, the number of completed foreclosures has slowed," said Anand Nallathambi, chief executive officer of CoreLogic. "Since the foreclosure inventory is also coming down, this suggests that loan modifications, short sales, deeds-in-lieu are increasingly being used as an alternative to foreclosures to clear distressed assets in our communities. This is what was envisioned with the recent National Foreclosure Settlement, and can often be a better outcome for both borrowers and investors." California, Florida, Michigan, Arizona and Texas had the highest number of completed foreclosures in the 12 months ended in March. The five states accounted for nearly half of all foreclosures in the nation. The highest foreclosure rate was in Florida at 12.1 percent, nearly twice that of the second highest state, New Jersey. Other states in the top five were Illinois, Nevada, and New York.